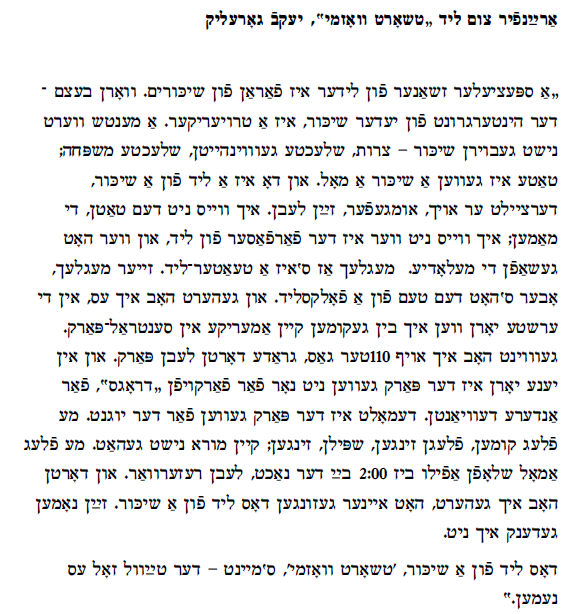 Jacob (Yankev) Gorelik was born in Schedrin (Shchadryn, Scadryn) Belarus, and came to the US in the 1920s. This performance was recorded at a concert in New York City on November 10th, 1990, organized by Center for Traditional Music and Dance, then called the Ethnic Folk Arts Center. 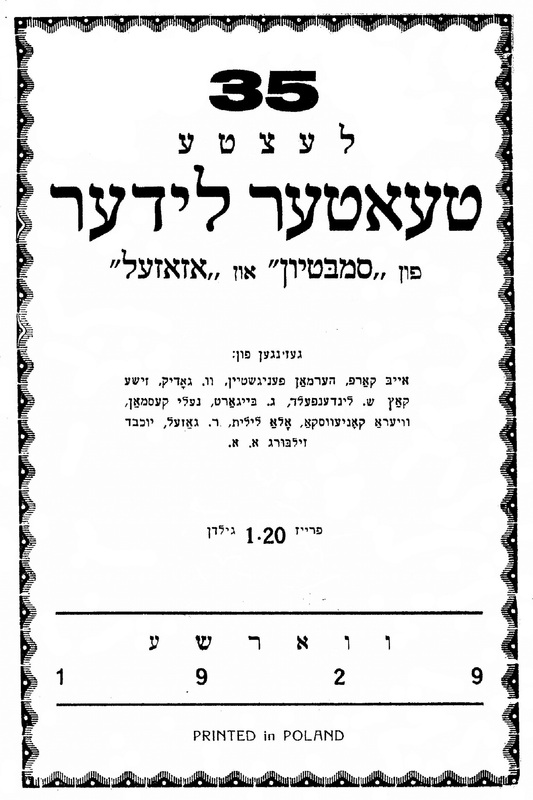 This event was part of The Yiddish Folksong Project which had similar aims to the current An-sky Folkore Research Project. Other singers performing that evening were Beyle Schaechter-Gottesman and Paula Teitelbaum. We eventually hope to post some of their performances from that concert as well. Gorelik died in Miami in the late 1990s. The song „A bayshpil‟ (An Example) is a version of „Der alter foter‟ (the old father) by Elyokum Zunser, probably the most famous and popular badkhn of his time (1836-1913). 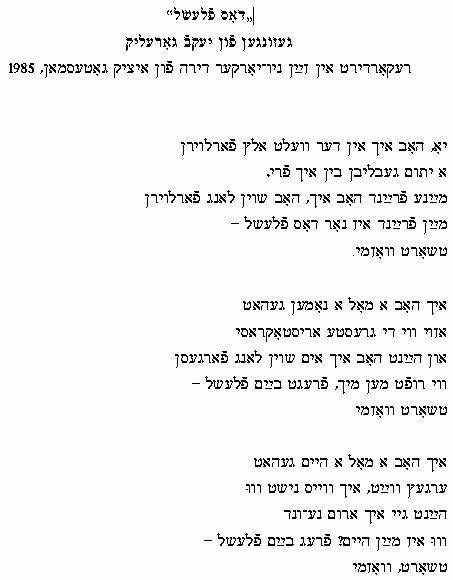 I have scanned the original version of this song in Yiddish as it appears in his collected works, Elyokum Zunzers verk edited by Mordkhe Schaechter, YIVO, NY 1964. p. 242-243, first published in Zunser‘s collection Hamenagin, 1873. One quick episode from Zunser‘s autobiography which was unforgettable when I read it: his wife fell asleep in a horse and wagon with their baby on her lap in the woods during winter. When she woke up, she realized the baby fell off the wagon and when they went to retrieve it, wolves were in the middle of devouring it. Zunser‘s songs, in my opinion, aren‘t particularly catchy or melodic, but he was a badkhn/wedding performer who emphasized the ethics of Jewish life, rather than the entertainment value of his work. Gorelik learned this song from his mother in Schedrin and his clear tenor expresses the message beautifully. dem sof fun mir batrakht atsind. eyder onkumen tsu a kind. the end of me, please consider. than to depend on your child. gefirt gants sheyn mayn velt. and led a beautiful world. they should become decent people. Mayn gvirishaft, mayn gantse kraft. Ikh hob zikh nit vu ahintsuton. I lost it all for my children. Today the door is locked for me. I don‘t have anywhere to go. aza elter vi ikh hob zikh dervart. from such elderly years as i had waiting for me. their first tooth in their mouth. der tate shtelt zayn lebn ayn in kon. the father risks his life.